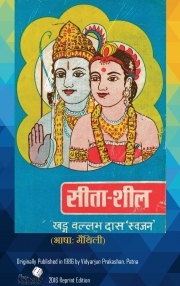 Description of "सीता शील - Hardcover (2016)"
"Seeta Sheel", a Maithili-language, poetic epic book depicts the life, struggles and ideals of goddess Seeta who is revered for her devotion in the Hindu mythology. The complete life story is presented in two-liner verses. Seeta, the legendary wife of Lord ShreeRam was born in ancient Mithila and spoke Maithili. The rhythm, word-choice and vocabulary that the author has adopted in the book makes it an exilerating, smooth read. The life-sketch of Seeta is based on TulsiDas’ Ram Charit Manas. Beyond the central contents, the author devotes a page on depicting the god names in terms of numbers; and another on showcasing how a full poem could be written without using any “matras” (vowels) in Devanagri script. The 244 page hardcover edition was first published by Vidyarjun Publications in 1986. Reprinted with minor modifications. Shri Khadga Ballabh Das (1909- 1999), completed authoring the poetic “Seeta Sheel” over several months following his voluntary retirement from the Government Press in Gulzarbagh Patna. He was known for his impeccable verse-authoring skills. Shree Das was a mathematics enthusiast, poet and war veteran. During the second World War he served in the British Army as an automobile technician; but developed a deep appreciation for the Indian freedom movement soon after. An excellent story teller, Shri Das was known for his dynamic cultural skills (such as conducting mathematics shows), social work, scientific experiments and, of course, literary works. Some of this dynamism is also reflected in the supplements to “Seeta Sheel” as book appendices. During latter years of his life, Shri Das built a Shri Krishna temple in Imadpatti (Madhubani), his ancestral village. He was married to Mrs. Indramaya Devi (1912-1992) . They had two sons and a daughter. He enjoyed full support for his dynamic endeavors from his sons, Shri Lakshman Das (1932-1993) and Shri Ramakant Das and daughter Smt. Vidya Devi and their spouses and families. Reviews of "सीता शील - Hardcover (2016)"